Top of the morning to you! Are you ready for the Year of the Earth Pig? Chinese New Year is on February 5th. Per Chinese Zodiac, the Year of the Earth Pig 2019 is supposed to be a year of joy, benevolence and relaxation…Hmmm…as it marks the end of a complete rotation cycle of the twelve signs in the Chinese zodiac. This encourages us to take a well-deserved break and evaluate the previous years. Well, I’ve definitely thought about how much I want to make this a different year than 2018. How about you? I’ve begun the first days of 2019 practicing yoga every morning before work. I’ve failed so many times in the past two years to regularly make time for exercise, which I attribute primarily to fatigue and a lack of motivation. I’ve been told over and over again that exercise helps fight that fatigue. Well, it worked when I was in grad school; however, once I entered the professional work field, prioritizing my health went down the tube. Anyway, I’m determined this year to be fully in control of my mind, body and spirit. No more blaming work or anything else for a lack of good health, spiritually, physically and emotionally. I’m focusing on bringing more joy into my life via music, creativity, yoga and learning. This morning during yoga, I felt anxiety right at the center of my chest. I set an intention for clarity and creativity and to let go of judgment and self-doubt. I’m facilitating a training over the weekend with two of my co-workers, which always brings some stress and anxiety. This calls for preparation, clarity, and flexibility because things just don’t always go the way I anticipate. I feel much more confident when all of my ducks are in a nice, pretty row; however, often life calls for flexibility and to go with plan B. As I begin my day, I hope to keep a steady heart and peaceful mind. I hope to accomplish what is meant to be accomplished, even if it isn’t quite what I initially set out for. May you also have a day and year full of peace, clarity and joy even amidst the mess that is so often our lives. This entry was posted in Culture, Health & Wellness on January 18, 2019 by Mj. You’ve probably heard it said that music has the power to reach across cultures.It’s the universal language. In fact, almost every culture that’s ever existed has a history of musical traditions or a body of folk songs that are passed down, often as children’s song. No matter what part of the world you live in, music brings joy, connects and touches lives significantly. I remember a special record of music from around the world that my adoptive mom gave me as a little girl. There was one song in particular, a Japanese folk song, called “Usagi” that I listened to over and over again. To this day, I remember every single word of that song! In fact, I could sing it for you. I loved the lilting pentatonic melody, so exotic and beautiful to my little ears. Recently, I learned from NPR of a newly released collection of children’s folk songs that you can pass along to your kids. 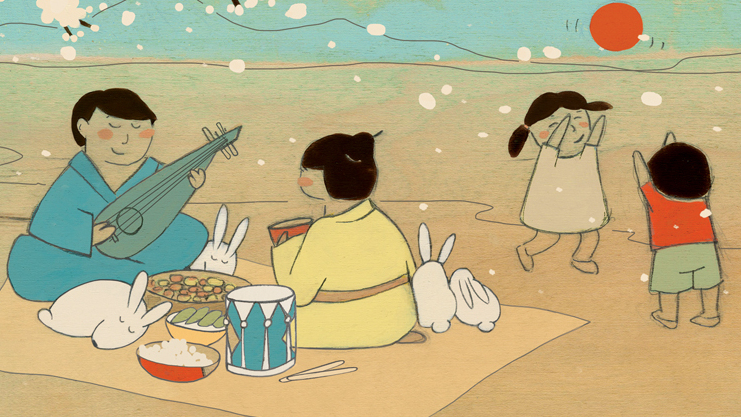 It’s called “Rabbit Days and Dumplings” and is a collection of songs from East Asia. The CD is a creation of Korean musician/violinist, Elena Moon Park, in collaboration with children’s music favorite, Dan Zanes. Park is a Korean-American who was born and raised in East Tennessee by immigrant parents from South Korea. She and Zanes, along with several other musician friends, have worked together musically for years as Dan Zanes and Friends, a popular children’s music band. For this project, Park also brought in several other musicians from around New York City. Park says that “seeing a lack of music from this part of the world in the family music scene” is what prompted her to make the CD. There are 16 songs collected from China, Korea, Japan, Taiwan, and Tibet. Highlights include, “Doraji,” a traditional Korean song about the doraji, a root that is used for medicinal purposes and “Diu Shou Juan,” a cheerful recording of a game song from China. One of the songs from Taiwan is called, “Diu Diu Deng,” a train song, featuring Wu Man on pipa, a Chinese stringed instrument. According to Park, “The lyrics of the song are basically describing a train as it enters a tunnel, and water drops on top of the train, makes that sound — ‘diu diu’ — which sounds like a coin that’s flipping onto a surface.” Then there is “Ti Oh Oh,” one of the sillier songs on the album. It’s also Taiwanese with lyrics that talk about a grandmother and grandfather having an argument over whether to season their eel spicy or bland. In addition to the wonderful music, the CD comes with beautiful artwork and liner notes illustrated by Kristiana Parn and Sonia de la Santos, as well as background information about each song. I think whether Asian or not, you will be delighted by the eclectic mix of cross-cultural songs on this CD. To listen to “Diu Diu Deng” and to read more about Park and Rabbit Days and Dumplings, please click here. Happy listening! This entry was posted in Culture and tagged Music on October 20, 2012 by Mj.